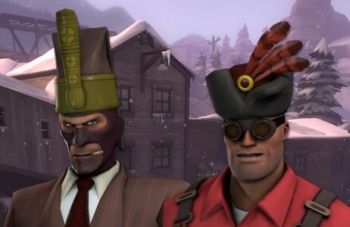 Those Team Fortress 2 hats you've saved up may actually net you a profit. It's been almost a year-and-a-half since Team Fortress 2 went free-to-play, and it seems to have been a successful move. Valve's popular multiplayer shooter continues to rake in crazy amounts of cash despite the non-existent price tag, which has encouraged the developer to experiment further with its pricing models. Now players can beta test one such experiment: the Steam Community Marketplace. The concept is exactly what it sounds like: Steam users can sell their hard-earned Team Fortress 2 items to other players for an increase of funds in their Steam Wallet. More importantly, if the beta run is successful, Valve may extend the Community Market to include in-game items from other titles in its catalog. "With over a half million trades made every week, the trading system has been very successful," Valve's Tony Paloma said in a statement. "Extending game economies beyond trades and giving players a way to turn gameplay into funds for new items and games is a key component for moving that success forward." For the duration of the beta, only consumables and tools are available for purchase and sale, including paints, keys, crates, and even Mann Co. Tickets. As of writing, there are just over 60 Team Fortress 2 items listed, but behind the items are be hundreds of sellers offering prices as low as a quarter. Valve takes a standard 5% Steam Transaction fee from each purchase, as well as a game publisher fee for Team Fortress 2 currently set at 10%. If the Steam Community Market is a success, its future could go well beyond paints and keys. The game publisher fee alone is a strong incentive for other publishers to integrate their games with the Community Market once it exits beta. And why stop there? Taken to extremes, the Market might even allow Valve to implement used digital games sales while providing publishers with a cut of the profits. There's a lot of potential for an online marketplace like this, although at the moment, I expect most fans will just be happy the day used TF2 hats go up for sale.